The 2010 launch of a new Carter Center-supported initiative is helping the Azi family and millions of other Nigerians receive greater access to malaria control and prevention, building the opportunity for a healthier future for the entire nation. Just outside Fobur village, central Nigeria, the extended Azi family has taken a break from their daily chores and gathered at their large stone compound to welcome some very special guests. It is late August 2010, and Carter Center-supported health workers have arrived to test family members for malaria, and if necessary, provide free treatment. Endemic to 90 percent of Nigeria, malaria is a potentially fatal parasitic disease that causes periodic fevers, intense headache, and body-shaking chills. Since 1988, The Carter Center has worked with the Nigerian government to prevent disease, conducting pioneering work integrating malaria control with lymphatic filariasis elimination and river blindness control in four program areas-Plateau, Nasarawa, Imo, and Ebonyi states. To fight malaria, the Nigeria Ministry of Health recently set the historic goal to equip every household with long-lasting insecticidal bed nets that can protect all family members from the night-biting mosquitoes that spread the disease. As part of the program's launch, Carter Center-supported health workers surveyed villages like Fobur in Plateau and Abia states to better understand the national prevalence of malaria and anemia, evaluate the level of net ownership and use, as well as identify how much communities know and understand about malaria and its treatment. The Carter Center and the Nigeria Ministry of Health have worked together for more than two decades to fight neglected diseases, starting with the establishment of a Guinea worm disease eradication program in 1988. Since then, using the same health infrastructures created through Guinea worm prevention, The Carter Center and its partners have pioneered new techniques to integrate prevention efforts to control other neglected diseases such as river blindness, lymphatic filariasis, schistosomiasis, and malaria. "During our survey in Fobur, we tested more than 200 people-mostly children under 10 years old-for malaria, and about 10 percent of the community had the disease," says Carter Center Malaria Control Program Epidemiologist Patricia Graves. "But the Azi compound had a much higher rate of malaria than their neighbors. We think this may be because the house is located on the outskirts of the village, very close to the Lege River, a prime breeding ground for mosquitoes." The Azi's three youngest daughters, Dorcas, 10, Rachel, 7, and Keziah,4, have been sick with malaria on and off since June, interfering with Dorcas and Rachel's ability to learn in school. The family doesn't have enough bed nets for everyone at risk-Dorcas shares a net with an older sister and an infant, but the net is not big enough for their bed and cannot be tucked in to protect them while they sleep. Keziah shares a net with her mother that is old and riddled with holes. Adding to these challenges, the home's leaky ceiling allows mosquitoes to easily enter the home. 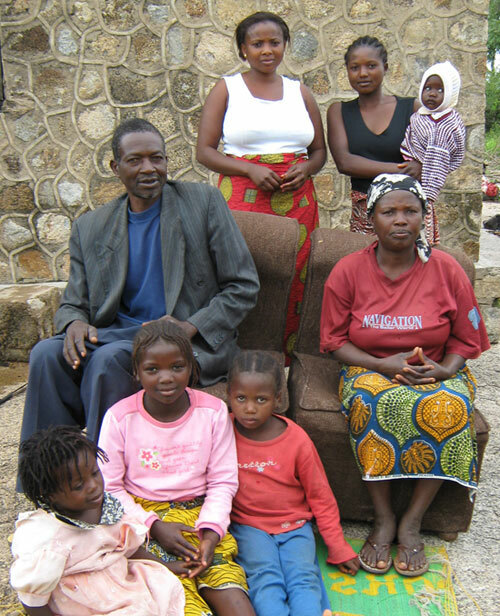 Health workers encouraged the family to attend a mass bed net distribution campaign in December 2010 to receive free new nets for their household. The girls and a few other family members who also have fevers are brought to a makeshift laboratory set up on a brightly colored carpet to give blood samples. Soon, the test results are ready. Rachel and Keziah, along with two other relatives were confirmed to have malaria and were given free, effective anti-malarial medicine. "The Azi's work very hard to build a better future for their family. We owe it to them and families like them in Nigeria to help ensure that future includes better health," says Graves. Lab scientist Solomon Izang tests 10-year-old Dorcas Azi for malaria in Fobur village as part of a two-state malaria survey in Nigeria. Dorcas was found not to have malaria, but her two sisters were infected with the potentially fatal disease and were given free treatment through a new Carter Center-supported initiative. 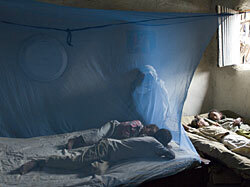 The Azi family, living on the outskirts of Fubor village, Nigeria, was disproportionately afflicted with malaria. In 2010, at the request of the Nigeria Ministry of Health, the Center began scaling up activities to include bed net distribution to villagers such as the Azis, as well as health education and assistance with monitoring and evaluation of the program. Long-lasting insecticidal bed nets protect people from the night-biting mosquitoes that transmit both malaria and lymphatic filariasis in parts of Nigeria.